The Indian Space Research Organisation (ISRO) is focusing on developing a manned space vehicle to carry a crew of two or three members to the low earth orbit and return safely to the earth, said Unnikrishnan Nair, Project Director, Human Space Flight Project, ISRO. 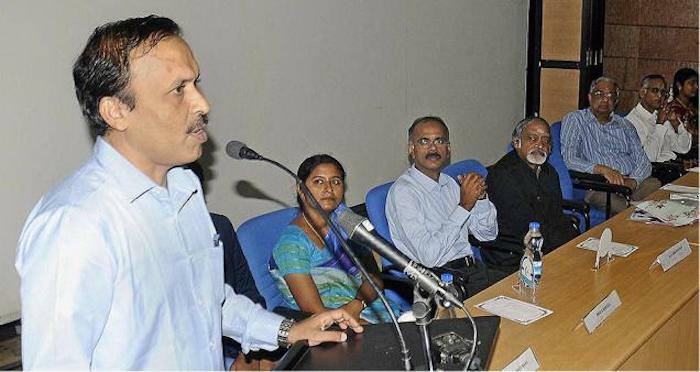 Delivering a lecture after launching an online portal “Direct” of the Electronics and Communications Engineering at the National Institute of Technology-Tiruchi here on Wednesday, he said the ISRO had been working very hard for the launch of manned space vehicles. Various units were working for the successful launch. All aspects, including safe launch, effective ground monitoring, cabin crew safety, living space capsule model, and contingency plans were closely studied. While stating that successful launch was the prime objective of manned space mission programme, ISRO was working out modalities for the safety of the crew members if anything went wrong during the launch. The launch vehicles should be intelligent enough to safeguard the crew members. The launch vehicle should have a number of support systems. It was a challenge. However, the ISRO would find solutions to all challenges so as to make the mission a success, he said. He said although there was no rating mechanism for the launch vehicles, the ISRO had been systematically working to make launch vehicles as much reliable as possible. The country had demonstrated its brilliance on space mission time and again. Several countries were surprised when Chandrayan and Mangalyaan (Mars Orbiter Mission) were successfully launched. S. Srinivasan Sundarajan, Director, NIT, said organisations such as ISRO and Defence Research Development Organisations (DRDO) had been working on a number of projects with huge budget. There were many opportunities available for the young students, scientists, and researchers. It should be fully explored. D. Sriram Kumar, Head, ECE, S. Raghavan, Professor, and B. Venkataramani, Dean, Research and Consultancy, NIT-T, spoke.